Mr. 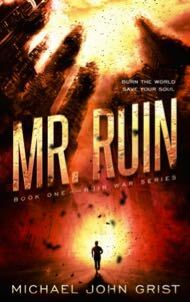 Ruin is a Hard SF thriller, Book 1 in the Ruin War trilogy. Your mind is the battlefield. In the war that devastated the world, ex-marine Ritry was a ‘Graysmith’ – an elite interrogator who dived deep into the hellish fires of enemy minds. His efforts made him a hero, saving countless lives, but also scarred his sanity and lost him everyone he ever loved. Now Ritry sees a chance at redemption. A shadowy figure known only as Mr. Ruin offers him an awesome power – the ability to dive not just into minds, but into the fabric underlying reality itself. Ritry could rewrite his past and start again. But there is a terrible cost – as Mr. Ruin demands Ritry’s absolute loyalty. And Mr. Ruin is not a good man, with vicious deeds in mind. Ritry only has to choose. The powerful Mr. Ruin hunts broken ex-marine Ritry into the hellish fires of the mind. “The twists & drama of this roller coaster ride are wild from the start.” – Bethany. To see the evolution of the book cover and marketing package, go here. Chapter 1 of Mr. Ruins here. I think is an eye opener. It beats my imagination. MR. RUINS /A NEW APOCALIPTIC VIEW? 1st. I fall in love with the Cover of the book, a runt with big teeth. 2nd. As I love the book, also think will be a little hard to understand for some readers (Post-Apocaliptic, Sci-Fi, Crime Bosses Mix) A cup full with: plots, vocabulary, characters & Apocaliptic views, can I had to say more?. Without “ruin” Mr. Grist book, lets begin with, Mr. Ruins. What a character!!! Despise him but what a yummy character to know?. In a world in “ruins” what better than had Mr. Ruins with long fingers, full of mystery (what else? and an “agenda”? Ritry Goligh a graysmith (mind doctor) using high-tech, doctor of minds, in deep trouble with a Crime Boss. Where to go?, Where to run? Whose going to Help? Ever heard of : “The Chord or Solid Core, The Maze, Polar…”? No, then read the book, I hate spoiling the fun. Great story, where the readers need their minds in the book so they discover a different world in an old world a nice “riddle” for you. A fast and slow pace story, good to enjoy a different “tune” of “Apocaliptic”. One star less for the complications of reading and some grammar errors. A complex book, certainly – but well worth making the effort to read it. What is more it actually ends (and on an upbeat) rather than just pausing, so that it’s possible to stop there (though the teaser to volume 2 rather puts a downer on that!) if so desired. Ritry’s world is an intriguing mix of dystopia and near-utopia, with the slums of the skulks outside the tsunami wall that surrounds Calico being buffer against the ruined world. There are glimpses of the history that led to humanity’s current situation which add depth to the backgound as well as to Ritry’s life. Definite 4 stars – on both Amazon and Goodread’s scales. I was fascinated to read the blog post(s) about the evolution of the cover – which seems to have undergone yet another morphing, as well as a slight change to the title and the series name (Sonata to War). A flick through the opener to the kindle version on Amazon UK has a rather different contents page, too, though the opening pages seem to be the same. Thank you, Julian! I’m glad you enjoyed it. And you’re right, I’ve tinkered with the title, contents page, and of course changed the cover several times now. A lot of that was with the goal of making it a bit simpler, and also more accessible.